As is usual when I really love a place, I find it difficult to know where to start, especially when there is just too much to say. Buenos Aires has definitely fallen into this category, not helped by the fact that we hurried straight off to Mendoza, were surrounded by people in Salta and then had an exhausting journey to Bolivia. So all in all it’s taken me a while to write. My first impression of BA came when we walked from the ferry terminal to our hostel in the San Telmo area of the city. On route we passed masses of men sorting through even larger masses of rubbish, a surprising number of homeless families, the Casa Rosada lit up in fluorescent pink, some spectacular architecture and the permanent tents of various protests in Plaza de Mayo. BA’s eclectic nature really isn’t exaggerated. The next morning we decided to get our bearings with another free walking tour. This time with Maggie a passionate and charismatic Argentinian, who’s Italian roots were more than a little evident. We started in Plaza del Congreso, saw the Palacio del Congreso and it’s striking resemblance to DC, passed the length of Av de Mayo, taking in all the impressive European architecture (and avoiding the dog poo) before marvelling at Plaza del Mayo in the daylight. 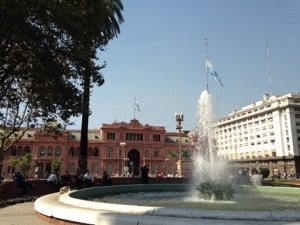 Here you can see the white Cabildo which has to be repainted every 10-14 days due to graffiti, the Greek looking Catedral Metropolitana and of course, the Casa Rosada in all it’s pink glory. I’m not going to lie, my main knowledge of Argentinian politics up to this point consisted of watching Evita. But throughout the tour Maggie shared much more of the nation’s history. For example, the lost generation of children who were taken from their revolutionary parents in the late 70s to early 80s and given to others to raise, many of whom’s whereabouts are still unknown. 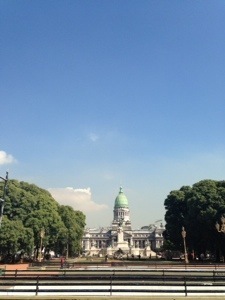 We then walked back to arguably the world’s widest avenue, Av 9 de Julio, to see the Obelisco and Teatro Colon. 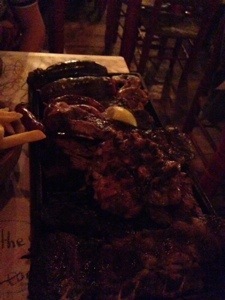 You can’t come to Argentina without sampling the meat. Argentinian steak accompanied by Malbec was obviously high on our to do list, and that’s what we did the next night, after quite a relaxed day. We’d been recommended a restaurant called La Cholita which is part of a family of four assado restaurants. One of the restaurant quirks was that the table was covered in paper and you received crayons, allowing us to release our creative sides for a while. I’d been told Argentinian assado was different to the Uruguayan one. I’m not sure I could tell a huge difference, it still tasted good! Maybe I prefer Uruguayan over all, but that may have been the circumstances. In true Argentinian style we didn’t even sit down for the meal until nearly midnight, which had given Liam sufficient opportunity to have a few wines beforehand. We ordered the mixed Assado for two. Wow. It was huge. We barely had to touch the fries, and, I think understandably, we didn’t manage to finish the whole thing. The next day we went our separate ways. Buenos Aries has a few amazing art galleries I really wanted to check out, and that isn’t really Liam’s cup of tea. 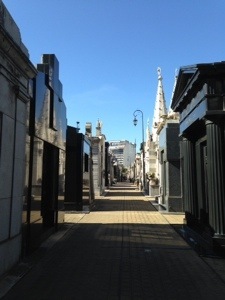 First though I had to visit the Cementerio de la Recoleta. It is basically a little town of family crypts housing Argentina’s upper classes over the years. Some of the tombs were amazing, so grand and impressive. Perhaps the most famous resident is Eva Peron, but even if the graves are essentially anonymous you could spend hours wandering around. Next on the list was the Museo Nacional de Bellas Artes where I managed to catch the free English tour, and see some important pieces of art. There was also an amazing REP illustration exhibition. My final stop of the day was the Museo Evita to learn more about the nation’s sweetheart. It was an interesting exhibition, it seemed to smooth over a lot of the negative aspects, and see her short life through rose tinted glasses. Plus, her outfits were on display, and some of them were beautiful. 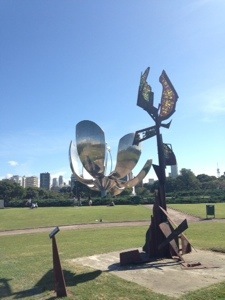 Throughout my cultured day I’d been impressed by the amount of green spaces in BA and the sculptures they contain. It really is a beautiful city where you could walk all day and not get bored. That night we were meant to go for tango lessons, but, alas, they were cancelled. Instead Liam had an early night and I headed out to sample BA’s famous night scene. In a city where people go to restaurants at 11pm, bars at 1am and clubs at 3am, it had a bit reputation to live up to. We went to see a DJ in quite a large group, but I bailed around 5am as I knew we still had a lot to see of the city. Sunday was market day. 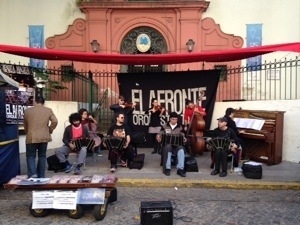 Almost every street and square in San Telmo, the traditional tango part of the city, had either music, food, antiques, tourist tat, or beautiful leather gifts on offer. We took our time looking around, enjoying the atmosphere, and people watching. My feet were starting to really hurt in BA so it was nice to slow down and soak it all in. 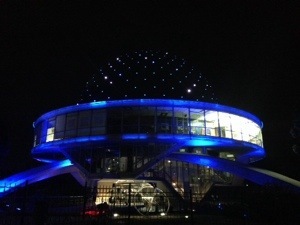 That night we headed to the Planetario to do something a little different. We sat back under the dome shaped roof and watched Tango 360, a film to music about the energy and spirit of tango and life in BA. It was fantastic. Afterwards we really did get to go and learn tango. We headed out of the city to La Catedral, a venue that resembled a village hall. The advanced class was going on when we arrived so we sat down, ordered some Malbec, and watched them do their thing. Before long (nearly midnight) it was our turn to ruin their national dance. I’d been hoping we’d each be paired with someone who had some idea what they were doing. No such luck. Liam and I tried, together, to make sense of the lesson which was going on in Spanish around us. Luckily our teacher had a raw energy that seemed to transcend the language barrier, even if we never did manage to perfect the steps. 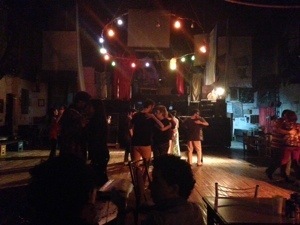 Afterwards we watched the Milonga, the dance hall, where all the locals stepped up to enjoy themselves. I’m probably never going to look like them, but at least I tried! Our last day in BA we tried to fit in everything we hadn’t done yet. First we headed to La Boca to see the colourful Caminito. I was disappointed to find the street overrun by souvenir shops, touristy restaurants, people dressed up to charge people for photos, and other gringo moneymakers. We didn’t stay long before we headed back towards town. I had one more gallery I wanted to visit, the MALBA (Museo de Artes Latinamericano de Buenos Aries) so I left Liam in Starbucks and headed in. Again I saw some fantastic pieces, by artists I didn’t even know existed, and quite a few that I was a bit puzzled by. Isn’t it always the way with art? The big draw was the temporary exhibition on the top floor. 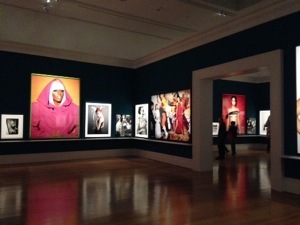 A fantastic exhibition by Mario Testino, the Peruvian photographer. He is responsible for some of the most iconic shoots and celebrity images over the last few decades. So many shots were immediately recognisable. There was a lot we didn’t have time to see in BA. We didn’t make it to Palermo to wander around and people watch (though I did see the inside of a club), we didn’t catch a proper tango show (though we saw the locals do their thing), we didn’t see a futbol game, or I’m sure many, many more things. But as I’ve said before, it just means we’ll have to come back. Fantastic blog this Elz, so interesting and well described. You really paint a colourful picture of the place, I wonder how much sleep you got whilst there?